While here in the Northwest, our bottled soda of choice is the ever popular Jones Soda (how could I hate a brand that makes Sweat and Fruitcake flavored sodas? ), we decided to pick up a bottle of bubbly beverage which hails from Bristol, RI. A little bit of online research determines they’re a smaller producer, but nice enough to put their phone number right on the label (we spared them any prank phone calls). One of the reviews I found bluntly stated, “The label looks a bit like the product was made in a garage“. I was eager to try this since I usually like to keep it real with good ol’ Kroger Diet Ginger Ale. After wrenching open the cap (then I noticed the “Twist Off Cap” twist), I was surprised by a quite sweet, non-hyper carbonated drink that lingered in my mouth for a bit. As another reviewer mentioned, the taste is less “ginger” and more “generic sweet soda”, though the hint of ginger sneaks up on you at the end. While this soda opts to use “100% cane sugar” instead of the standard/evil High Fructose Corn Syrup, I would say it’s probably equally sweet compared to a mainstream counterpart like Canada Dry, but without that syrupy feeling coating your teeth. 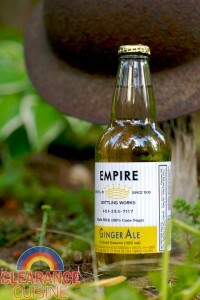 Empire Bottling Works also has a bunch of other varieties that I wouldn’t be opposed to trying, including a cola. I would advise the ginger ale is a decent replacement for your standard Schweppes and we got it for a pretty good price. Plus the retro-vintage style glass bottle makes me feel like a kid pretending to enjoy a beer. This entry was posted on Wednesday, July 20th, 2011 at 8:00 am	and is filed under Drinks. You can follow any comments to this entry through the RSS 2.0 feed. Both comments and pings are currently closed.